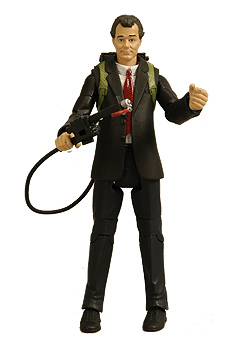 They're the best, they're the beautiful, they're the Ghostbusters™ − and you can trap one for your very own with our film-accurate 6” Peter Venkman™ figure from the Ghostbusters II courtroom scene! The first official release in our 2011 Club Ecto series, Peter comes with convicted murderer Nunzio Scoleri. Naughty Nunzio’s back from the dead with interchangeable standard feet and “flying” feet, while Peter wears his jacket from the courtroom scene. Peter is unslimed and features authentic details like the diamond pattern on his tie. Case closed, boys − this pair is a must-have for every Ghostbusters™ collection! 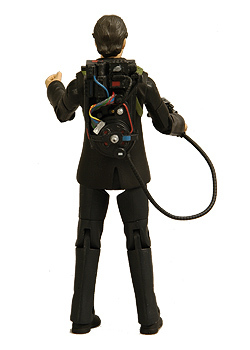 Venkman will be available for the fleet of finger on MattyCollector.com starting January 18th, 2011. He will run you $20 plus the applicable taxes and shipping fees. 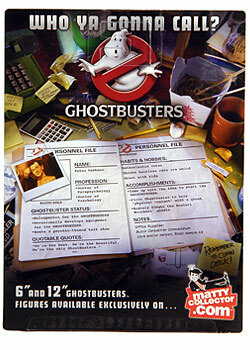 If you're a card carrying member of the Ecto-1 Club, Venkman will be automatically shipped to you. No fuss, no muss. 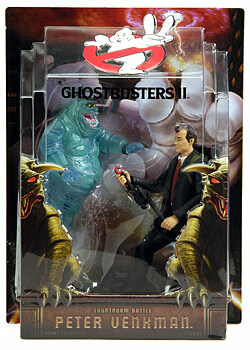 If you were expecting a Ghostbusters II Winston figure this month, you're not alone. 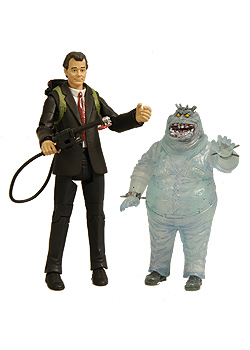 Winston with his slime blower was originally slated to be the Ecto-1 Club figure for January, but he was postponed and Courtroom Peter took his spot. No official word on why Winston was delayed, but the popular theory is that the slime blower is being redesigned to be more screen accurate. We're sure he will be worth the wait. His new head sculpt looks excellent. The rest of Matty's images can be found after the jump.